The Optomap digital retinal exam offers many benefits over the traditional dilated eye test to see the back of the eye. Besides not being inconvenienced for several hours from dilated eyes there are several other benefits to choosing this new technology that provides a more comprehensive view of the retina. 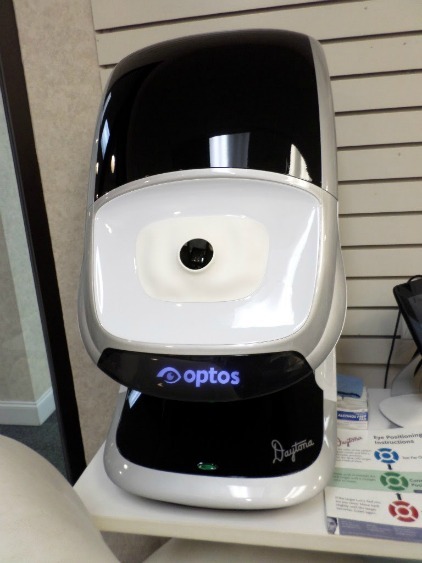 Optimal by Optos, Inc. is a new retinal imaging machine that provides a digital view using a low intensity scanning laser. 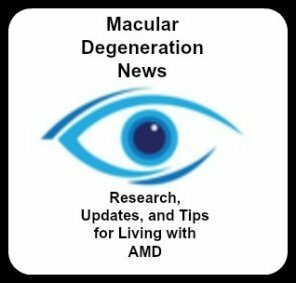 Optomap engineer Douglas Anderson, shares that he "set out to develop a patient friendly retinal imaging product that encompassed a digital wide field image of the retinal easily" twenty years ago when his then 5 year old son experienced permanent vision loss from an undetected retinal detachment. A patient simply looks into the Optomap machine one eye at a time. The patient will see a light flash once the image has been taken. It only take takes a few seconds to perform and is totally painless. 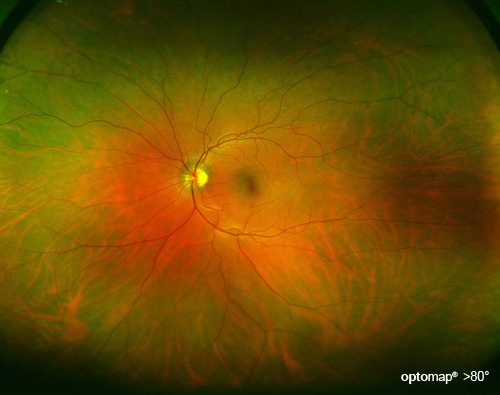 Unlike the traditional dilated eye exam, the Optomap machine can capture the image of the retina and save it. The eye doctor of course can review it immediately, use it for comparison with future images or share it with other health professionals. The device can be used with adults or children. A retinal eye exam is the only non-invasive procedure that can see blood vessels, arteries, veins and nerves. With this inside view of the body, eye doctors can detect retinal diseases or detachments as well as other health conditions such as diabetes or hypertension. Think of the image as a panoramic view of the back of your eye that includes the edges rather than a small center section of the retina. More than 80% of your retina can be viewed with a single image while a typical dilated retinal exam provides a 15% field of view. However, there are times when the eye health professional may decide that dilated eye exam may still be necessary. The frequency of digital retinal imaging is decided by the eye doctor but typically is done during each eye exam. Do what we did, perform a zipcode search at Optima's website to find out if there is an eye doctor near you that has this new improved technology and how much of it is covered by your insurance.